As housing backlogs continue to increase exponentially across the continent, the need for investment is becoming increasingly urgent. In this regard, housing—particularly for those who cannot afford to access it without some form of assistance—is slowly moving away from being seen as merely an act of philanthropy, and is beginning to be perceived as a credible investment sector. Yet, housing for the poor continues to be a social good. Jed Emerson, of Blended Value, asks: How do we begin to think about investing as a form of philanthropy and, the inverse, how do we begin to think about philanthropy as an investment that will yield financial return? With Blended Value, Emerson proposes a single act that will drive both efforts forward: impact investing. Impact investing involves investments made into companies, organisations and funds with the intention of generating a positive social and environmental impact alongside financial return; these investments are made across asset classes, sectors and regions. And it has the potential to unlock significant sums of private investment capital to complement public resources and philanthropy in addressing global challenges, according to the Global Impact Investing Network (GIIN). Because of its diversity, impact investment is difficult to fully quantify. However, GIIN members’ aggregate assets suggest that the market is substantial, and has significant potential for growth (see Figure 1). GIIN recently published two reports (in partnership with Dalberg Global Development Advisors and Open Capital Advisors, respectively) titled, The Landscape for Impact Investing in West Africa and The Landscape for Impact Investing in East Africa. These reports interrogate the supply of impact investing capital, demand for impact investing capital and the ecosystem for impact investing on a regional and country basis, while the highest degree of attention is given to those countries with the most active impact investment markets. On a regional basis, the reports considers the historical and political contexts, economic performance and structure, investment climate and drivers of foreign direct investment, interest rates and inflation and, finally, the ease of doing business. The West Africa report includes regional findings for five countries, as well as dedicated chapters covering Ghana, Nigeria and Senegal; the East Africa report also includes a regional overview and detailed chapters on specific countries such as Ethiopia, Kenya, Rwanda, Tanzania and Uganda. 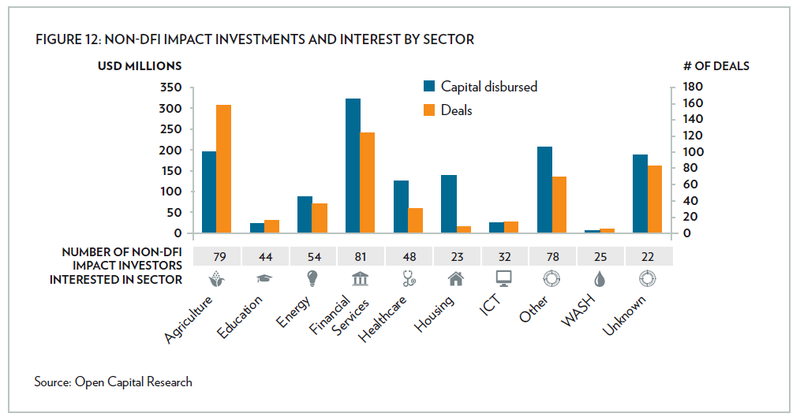 In addition, it highlights that, in East Africa, development finance institutions (DFIs) have deployed almost US$ 8 billion in impact capital to date, and that non-DFI impact investors have also invested over US$ 1.4 billion in more than 550 deals. The impact investing industry in West Africa is small but growing; GIIN reports that there are forty active impact investors in the region, including 13 DFIs and 27 other investors. 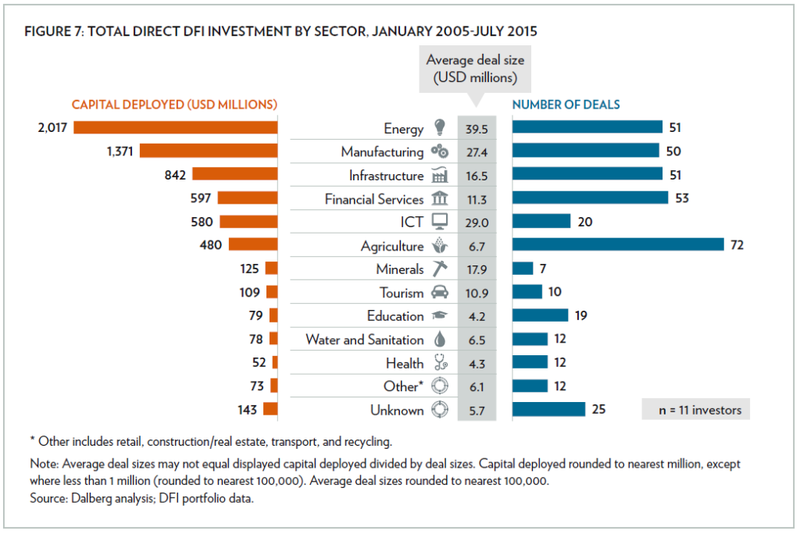 Direct investment by 11 of the DFIs and 26 of the non-DFIs totalled US$ 6.8 billion between 2005 and mid-2015. Although this is small relative to East Africa, which received US$ 9.3 billion over the same period, despite the region’s gross domestic product (GDP) being less than half that of West Africa. In West Africa, DFIs have deployed 97 percent of the total impact investing capital, while growing their investments at an annual compound growth rate of 18 percent, i.e. from US$ 190 million in 2005 to US$ 852 million in 2014. Understandably, more than half (54 percent) of all impact capital deployed in the region was in Nigeria and Ghana. 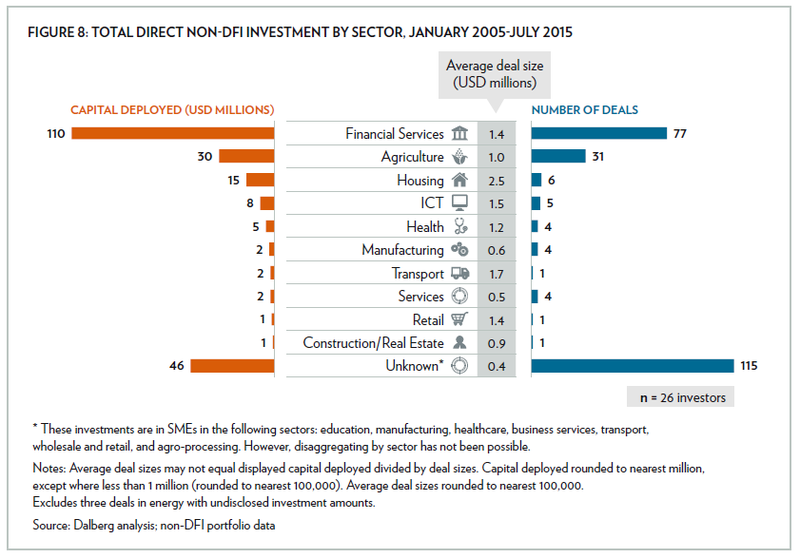 Capital deployed by both DFIs and non-DFIs is spread across several sectors (see Figures 2 & 3). It appears that deals specific to housing were few, and only by non-DFIs. As mentioned above, the East African impact investing market is gaining strong momentum; 155 impact investors have made investments in this region, including 20 DFIs and 135 other impact investors. The non-DFI impact investors have disbursed US$ 1.4 billion through more than 550 investments in East Africa, while the 20 DFIs have disbursed US$ 7.9 billion directly into East African enterprises and a further US$ 700 million into impact investment funds. Interestingly, almost half of all noted non-DFI impact capital has been deployed to Kenya—more than US$ 650 million of a total US$ 1.4 billion. Kenya has received more than double the impact capital deployed in Uganda, which is the next highest amount of impact capital deployed in East Africa. As can be noted in Figures 4 and 5, DFI investment was predominantly in the energy and financial services sectors, with the construction sector receiving one of the fewest number of deals and smallest amount in terms of direct capital investment. As with DFIs, non-DFIs also focused their attention on the financial services sector, with considerable investment also disbursed to the agriculture sector. As impact investing gains momentum in both West and East Africa, it will be interesting to see whether the strong interest in the financial services sector by DFIs will trickle down to investment in housing. Perhaps, understanding the logic behind non-DFI investment in the housing sector could begin to reveal the reasons behind the lack of investment in this sector by DFIs, and harness more impact investments for residential housing.